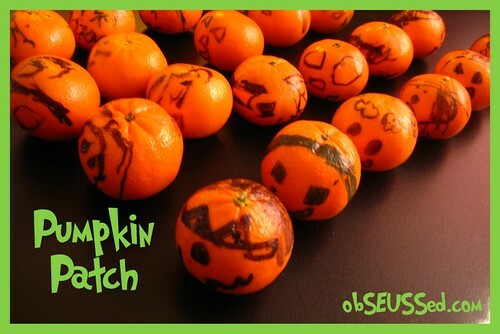 If you don't have time to carve a pumpkin this Halloween (or if you want to avoid the mess) try some of these quick pumpkin activities. 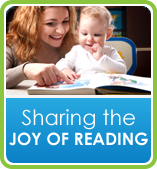 Start with a book at bed time. 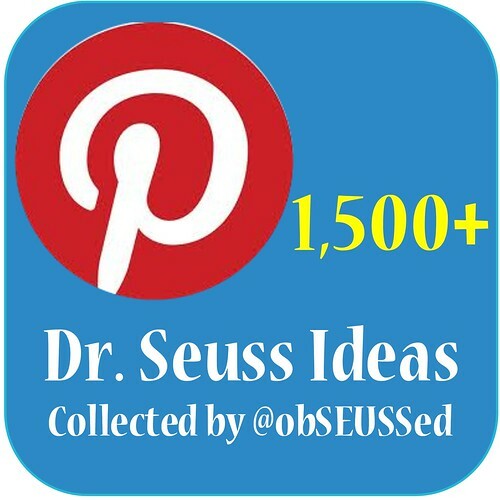 This one is great for toddlers too. It has been a traditional rhyme since my mom was a little girl. She taught it to me and I'm sure most people have heard it. 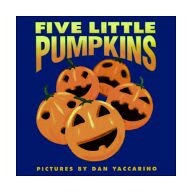 The poem, "5 Little Pumpkins," can be found in this cute book by Dan Yaccarino or below. Remember to clap your hands (or really turn out the light) at the part where you say "Out went the light"
And those five little pumpkins rolled right out of sight. 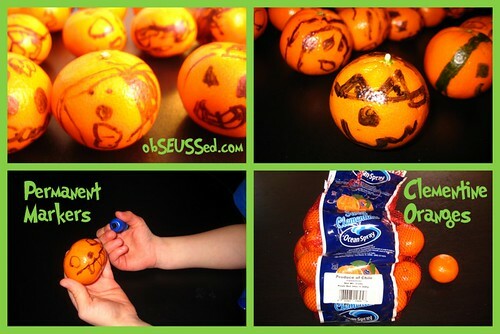 Get some cute Clementine oranges and give your kids some permanent markers to decorate faces on them. Under adult supervision my 4 & 6 year old loved this. Then they gave a bag to our neighbors. PIPE CLEANER PUMPKIN: Use pipe cleaners to decorate a pumpkin in under 5 minutes. Curl a few or leave them straight. Use siscors to cut them (they are way too hard to pull apart by hand - trust me, I've tried. Remember there is a wire under that fuzz). 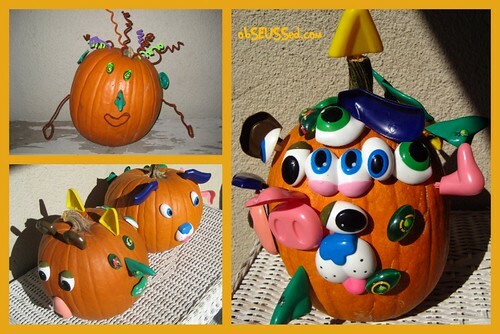 POTATO HEAD PUMPKIN: Use pieces from Mr. Potato Head toy or buy pieces at the store that have a little bit longer and pointy tip. You can find them all over. I've seen them at Target and WalMart. Our kids like to change the look every day for a fresh spooky surprise. 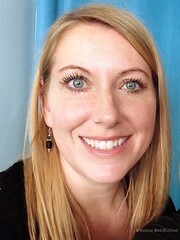 Or try 4 faces at once (on each side) so you can rotate it to your favorite each day. 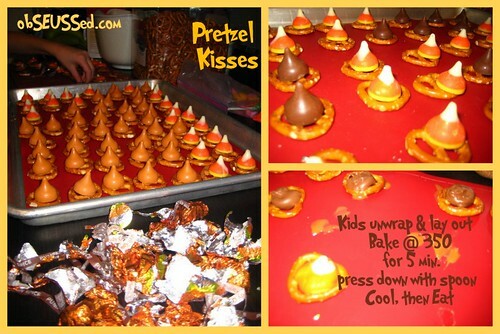 PUMPKIN PRETZEL KISSES: These are a favorite new treat. The kids did all the work for these. I preheated the oven to 350 degrees. My 6 year old lined up pretzels on a cookie tray, my 4 year old unwrapped all the kisses (Pumpkin Spice, Candy Corn and Carmel Apple flavors) then set one one each pretzel. Then I popped them in the oven for 5 minutes to melt, took them out and pushed them down a little with the bottom of a spoon. The carmel ones got messy and stuck to the tray but the others turned out great. 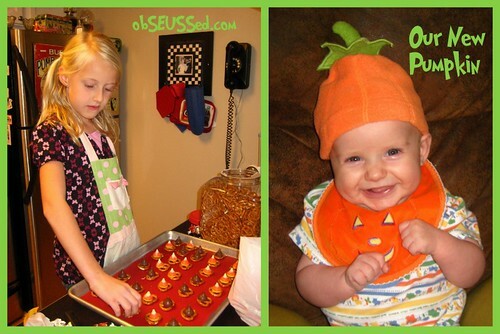 ﻿Here is one of my little helpers and my cute little 3-month-old pumpkin. Love the kisses, and I love the oranges idea! That would be a great classroom snack!